It’s no secret that 2012 has been the year of The Diet for me and Gem, something she’s been far better at chronicling than me. So far, between us we’ve lost just over 6 stone (that’s 84lb, or 38kg if you prefer) which is a fantastic achievement, and one we’re both more than happy with. I’m now lighter – and fitter – than I’ve been in about 15 years, and reaching the end of my weight loss journey. Gem has a bit further to go, though, but I’ll be supporting her every step of the way. Over the past few months we’ve obviously discussed The Diet a fair amount, but have tried to be careful with how much the girls are exposed to it – for all sorts of reasons, but mainly because we don’t want to instill any unhealthy fears in them about their size. Imagine my absolute horror, then, when the following incident occurred last week. It was my turn to put Heather to bed, and as ever I let her pick which bedtime story she wanted. 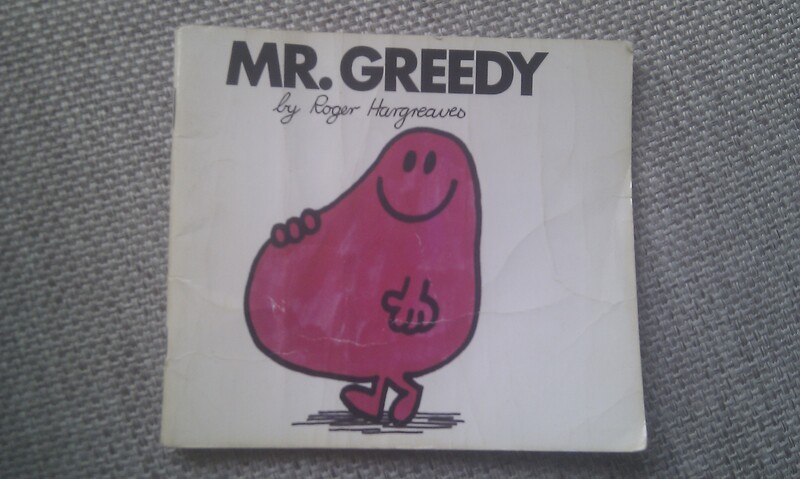 She chose Mr Greedy, a book which had been mine as a child. I know this, because over 30 years ago I’d written my name, address and age (5 1/2) on the title page. Of course I did my best to reassure her that she’s not fat (her height and weight are perfectly in proportion according to medical charts) and that she shouldn’t worry about things like that, but I was left feeling uneasy – was this something we’d caused? Has casual talk of smaller tummies and openly weighing ourselves in the bathroom created an unintentional monster? And the most horrible question of all – if she’s already thinking about this stuff at 3, what problems are we going to face in the future? Gem had a similar experience the following night, and again made the same reassuring noises I had. So it wasn’t an isolated incident. Oh dear. We’re hoping it’s something that will disappear on its own. We’re being extra careful when we talk about weight/diets, and have taken the short-term step of removing Mr Greedy from Heather’s bookshelf. So far there has been no more mention of fatness from our eldest, which is a good thing. Long may it continue! By complete coincidence, Gem came across this story (sorry, it’s on the D**ly M**l website!) about a new information pack about body image, which was published last week. Seemingly (I haven’t actually read the pack yet) it contains all manner of advice to educate kids about airbrushing, and not discuss diets or your own body concerns in front of them. It’s always easy to dismiss these things as nanny state meddling, and I’m sure there will be some advice in there that will seem ludicrous, but after last week’s incident I’m interested to read what the pack has to say. To that end I’ve searched and found the pack online, and am about to download it for myself. Maybe I’ll write a follow up piece when I have. One thing I’ve already noticed, though, is that the pack is aimed at dealing with children a good bit older than Heather. And maybe that’s right, but based on my experiences I think body image should be added to the list of things us parents worry about from day one. This entry was posted in Books, Family, Parenting and tagged body image, diet, fat, gem, heather, mr greedy by richy. Bookmark the permalink. That’s a tough one isn’t it? On the one hand you want to show that it’s positive to take care of your body and reduce your weight. But on the other no parent wants their child to worry about something like that. Hope it does pass and she returns to worrying about normal child stuff, like which flavour of ice cream is her favourite. The frustrating thing is not knowing how much of it is us, how much of it is TV (she doesn’t really take in any other “media” yet) and how much is from elsewhere – I know for example that nursery have been doing a health and fitness thing tied into the Olympics, although I’m 100% sure they won’t have been telling any kids they were fat! Hasn’t come up since last week so fingers crossed. Favourite ice cream is probably whichever flavour she last had, which right now would be cotton candy from our local award-winning ice cream parlour!